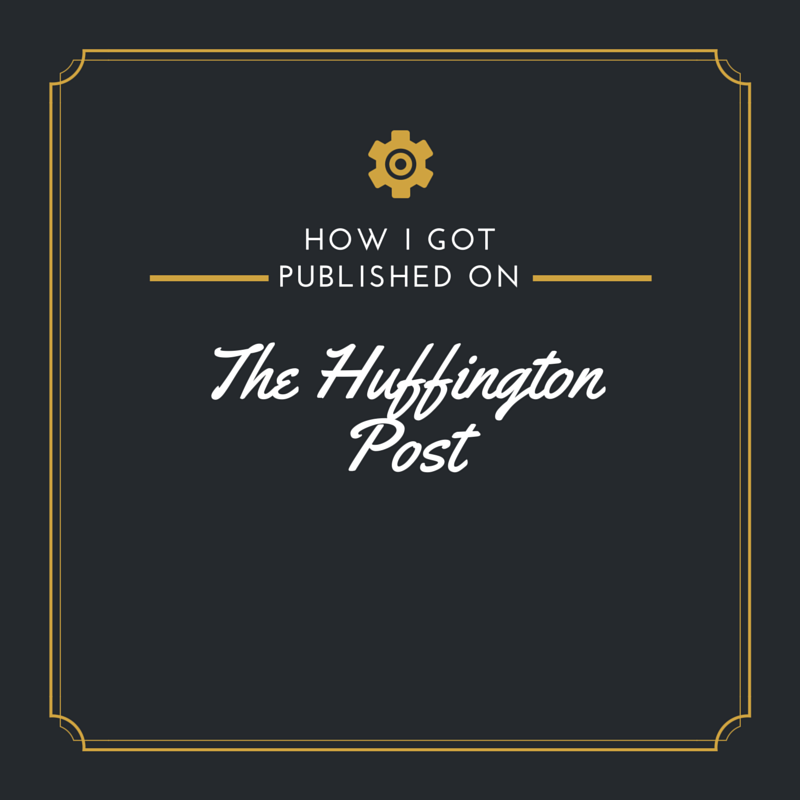 From the Editor: How I Got Published in the Huffington Post | LADY. Well, hasn't this been an extraordinary few days? On Wednesday night, I was driving home from work, listening to Taylor Swift's 1989 and thinking, "How in the world can I get anyone to care about my book if they don't even know who I am?" The existential and philosophical elements of this experience can be set aside for another post because, yes, they are a large part of it. But, for now, I'll stick with the practical stuff. As you know, my debut novel will be released this June. And it's being published by a wonderful small press called BookFish Books. The upside to having a small press is that you get to know people. They talk to you, not at you. They care what you think and why. They champion your work. But the downside (a better word might be "challenge") is that much of the marketing for my book has to be done by me. Of course, my publisher works hard at that, too, but, as the name implies, it is a small press. Not a large one. So even though I have a few hundred followers on Facebook, a few hundred on Twitter, and a few hundred on Instagram, it's really not all that much. Not in terms of book sales. It needs to grow and you can't just make people push a button and follow you. It has to be more organic than that. Strategic, but organic. They have to care about what you're saying. And they have to like you. But, first, they have to know who the hell you are. Which brings me to the lightbulb moment I had in my car. Hey! I thought. Taylor Swift's birthday is December 13th. And she'll be 25, which is a nice, round number. I should write a fun piece listing 25 things to love about her. Which, for a self-professed Swiftie, is not hard to do. I wrote most of the post that night on my iPhone and finalized it the next day. For months, I had been trying to get published on The Huffington Post. I'd Googled a number of other bloggers who had written about this very subject. And their advice was super helpful. (Thanks!) But since you're here and not there, I'll tell you what worked for me. There is a contact form on HuffPo's website where bloggers can pitch a post. It's pretty basic and I had submitted two other articles using it before. No response. From what I've read, it's kind of a black hole. I imagine it would be considering HuffPo's international audience and the number of submissions they probably receive via that form. Lots of bloggers suggested submitting to the blog team's email, but that account is reserved for current HuffPo writers who have already been published on the site. It's not for new submissions. (As I found out for myself.) Some had emailed Arianna Huffington directly and had success. Some had been approached by HuffPo when their original blog post went viral. But most had simply found the contact info for a relevant editor and submitted directly to him or her. First, I submitted my post via the contact form. And then I went back and re-read the tips I'd found and discovered one of the writers had shared a link with the names of current HuffPo editors. I searched the name of the entertainment editor on HuffPo, found an article of hers, and voila! Right beneath her byline was her email address. At noon I emailed her my complete blog pitch and post, including links to my social media accounts, a bio, and a headshot for convenience. And five hours later I got an email from another editor welcoming me to the HuffPo blogging community. 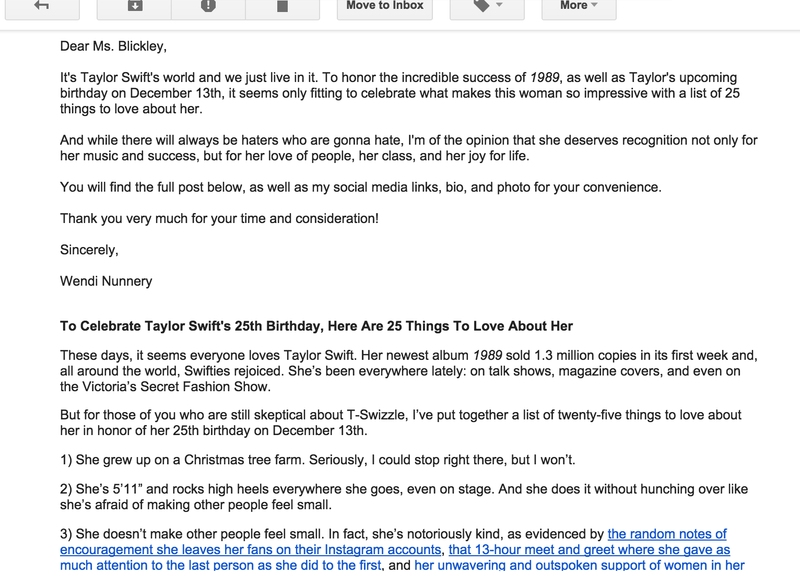 He sent me the link to set up my account and, from there, I recreated the Taylor Swift post within the HuffPo blogger dashboard. It's not that dissimilar from a Wordpress or Blogger platform. And the most wonderful part about having an account with HuffPo is that I can submit as often as I want. It's certainly not guaranteed that everything I write will be published, but it has a far greater chance. In other words, once you're in, you're in. 1) The post was timely and relevant. It's Taylor Swift's world right now. Her new album is selling like Girl Scout cookies and everyone (well, most everyone) loves it. And her birthday is December 13. I submitted my post on December 11. 2) I made it fun, a little humorous, and easy to read. The Huffington Post publishes everything from topics like politics, travel, and environmental issues to parenting, books, and entertainment. But for the purpose of my post, and for the audience who would read it, the content needed to be slightly fluffy. It wasn't meant to be serious, hard-hitting journalism. It was meant to be a celebration of Taylor's birthday and a celebration of who she is as an artist and person. 3) It was a list. HuffPo likes lists. They're easily shareable and quick reads. So I made a list. It's genuine, but also light-hearted. I couldn't really go wrong. Also, I didn't just send the post in an email without including a pitch to grab the editor's attention. In addition, I linked almost every reference I made where I thought readers would want to see how I got my information. It was a little tedious, but it likely made the editor's job a bit easier. That's always a plus. If you want to read the full article, just click the link below. What I learned from this experience is that success, small and big, can come from unexpected places and in unexpected ways. In fact, I have learned this lesson a couple times in the last year. And having my article published in HuffPo is a stepping stone to write about other, more serious issues that are also close to my heart. It's yet another way for readers to find out about my book and my publisher. It's a bite out of the elephant that is writing and telling stories. Most importantly, it gives me a chance to show people who I am and what I'm about. And it gives them a chance to care. Have you been published in The Huffington Post? What's your story? 1 comment on "From the Editor: How I Got Published in the Huffington Post"